> networks that use foaf in the hyperdata way. > the information is located in the same database, owned by the same company. > problem is: you need to find out when someone is linking to you. > them. Here are the solutions in order of simplicity. > which people are linking to you. > access to that information, and so will not be able to index it. 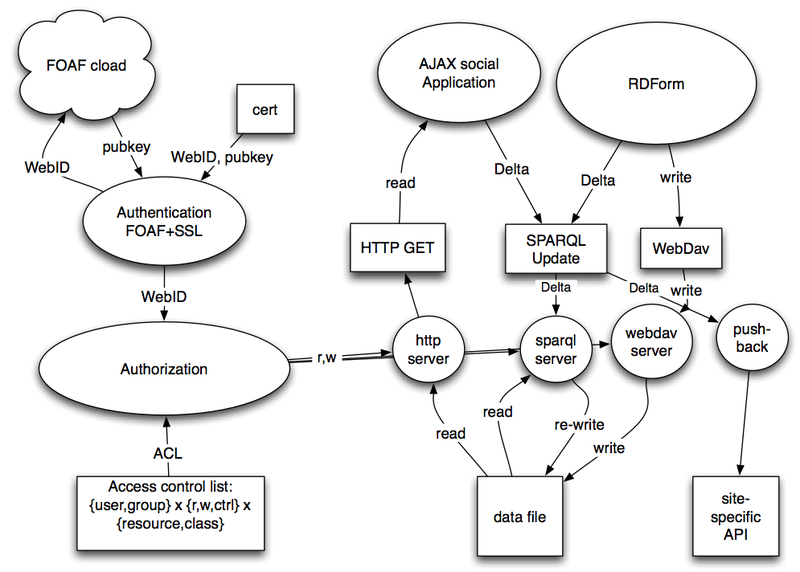 (write) using SPARUL or WebDAV and HTTP should be used for read operations. notifications, approvals etc.). Also compatible with FOAF+SSL Auth. > header of the request. > find the answer to the referrer in the web server logs. > /dataspace/person/kidehen HTTP/1.1" 200 19924 "http://bblfish.net/"
>  There is indeed a Wikipedia entry for this: it is called Refback. > solution is still a bit of a mystery to me. > request on your WebId. >   Here their WebId and the referer field will match. > to a LinkedIn introduction! > from the analysing the Referer field logs. > the pingback protocol was invented. > and people have moved on. HTML FORMS remain used by everyone everywhere. > every developer needs to know how to use them. >    :label "pingback service" . > relation, or to create a very similar relation to fix the bugs of pingback. > @prefix ping: <http://purl.org/net/pingback/> . >    document owner know that they are linking to this resource. >   by POST ing a  URL that mentions the given WebId. >   the above html form, making it human readable. >  can be described using this ontology. > especially if the resource returns a web form as described above.